Eastling Church lies southeast of the main street in the centre of the village, about 300 yards along Kettle Hill Road. The church is set back from the road and is surrounded by mature yew trees (one of which is more than 2,000 years old), with only the spire visible above them. Parts of the church, such as the base of the tower, date from the 11th century. The nave is from the 12th century; the chancel, the 13th; and the sanctuary and St Katherine Chapel, the 14th. In 1855, R.C.Hussey substantially rebuilt the nave, the north aisle and the south arcade, and completely re-roofed the nave (unfortunately destroying many medieval features). 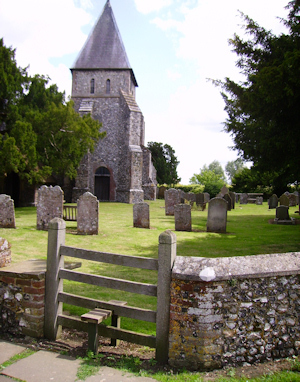 St Mary, Eastling, is part of the Benefice of Eastling and Stalisfield with Otterden. The Priest-in-Charge for the Benefice, currently vacant, lives in the Rectory at Eastling. Services are normally held in Eastling church every Sunday, except when there is a fifth Sunday in the month when a Benefice service is held alternatelyat Eastling, Stalisfield and Throwley.